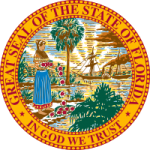 The State of Florida sets forth in Florida Statutes, Title VI, Chapter 61 the conditions and parameters of imposing a child support order on a divorced or separated parent. The statutes set forth the guidelines for taking into account income and deductions as well as costs and circumstances of each parent and each child in order to come up with an amount that each parent is obligated to provide to support their children. Factors include sources of income, how much income, costs, deductions for other child support payments and health insurance payments as well as other factors.